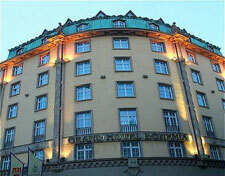 The five star Grand Hotel Bohemia is located near Prague Old Town center, Czech Republic. It's famous building was constructed in 1927. It is one of the most class and charming hotels in Europe and guests can expect to find a team of experienced staff ready to serve the highest demands, 24h per day. Near the Hotel there are some of the most important places in Prague a visitor has to see like the Powder Tower, Old Town Square, Old Town Hall, Prague Stock Exchange, Prague Castle, Charles Bridge, The Jewish Quarter, and the Old Quarters of Prague are under UNESCO protection among others. The Hotel rooms are prepared to give maximum comfort, class and beauty design to our guests. Equipped with all the facilities and amenities, the rooms are the hotels print regarding to luxury, such as LCD colour TVs and in every aspect luxurious bathrooms. Smoking rooms are available on request. The Hotel offers Superior rooms, deluxe rooms, junior suites, and Steiner suite. The Hotel has it own Restaurant - Franz Josef - where guests can enjoy some of the best dishes of international cuisine and seasonal flavors. As with the rest of the hotel services you highest quality in food preparation and service. To enjoy a quite environment for business meetings or personal delight, guests can enjoy the hotel Caf� bar with fresh sandwiches, sugar bakery, several types of coffee and tea. Events like Conferences and Seminars can be hold at the hotel. For those meeting events guests can enjoy the exclusive ambience of the unique Boccaccio ballroom from the early 20th century.Ballroom events, soirees, receptions, seminars, weddings and gala banquets for up to 180 people are held in the hotel for years, following the hotel practice of economical and cultural meeting center.